Cleaning motivation, housekeeping tips, and entertainment, as you trudge through those mundane household chores. Whether you clean your house every day or do a weekly deep clean, I’ll talk you through it! Clean along with a brand new episode published twice a week. Is Your House Company Ready? The host talks you through cleaning your whole house for guests and encourages you to be more observant when it comes to seeing your home through someone else’s eyes. The main focus of this episode is deep cleaning your kitchen, but as usual, there are lots of tips and tricks mentioned throughout the episode. Even if you aren’t expecting guests for Easter, it’s a good idea to deep clean once in awhile as if you really were having company over. The host talks you through cleaning your whole house while touching on ways she is trying to simplify her life. She also talks about which jars make the best drinking glasses and the benefits of having a “launch pad” near the front door. The host talks you through cleaning your refrigerator. In this routine whole-house cleaning talk through, the host provides cleaning motivation and warns against “coasting.” Reading fictional novels to relieve stress and cleaning out cat litter boxes are some of the topics covered in this episode. The host talks you through cleaning your house and touches on spring cleaning as well as just sticking to the routine. She includes a short rant where she laments the fact that someone assumed she was the grandma of a TWELVE year old. The host talks you through cleaning your entire house as she gives her thoughts on cleaning for company. Do people give your daughters thousands of beads that end up on the floor? De-cluttering using the “one in, one out rule” and donating to charity are other topics addressed in this motivational episode. There is also an emphasis on regular bathroom upkeep. Don’t Forget to Declutter your Bedroom! This whole-house cleaning talk through includes a plan of action for your dirty old throw pillows. The importance of doing dishes each day is emphasized, but there are also some hacks for dealing with dried on food when one has fallen behind. Listen to find out which everyday household liquid removed rust from a relative’s sink and what I think of Elderberry syrup. This whole-house cleaning talk through is about what to do when you’ve been sick or otherwise hindered from spending much time on housework. Later in the episode, Jemma Stone calls in with a bathroom cleaning dilemma. Kids’ chores are also mentioned. I talk you through cleaning pretty much your entire house as I discuss the importance of prioritization. I also touch on organizing the cupboard under the bathroom sink. More cleaning motivation! In this cleaning power hour, I talk you through cleaning your house and discuss some ways to stay motivated by managing your time better. I also talk about a couple of solutions for those of you who keep shoes by the front door. Interview with a listener about how keeping a tidier home has improved her mental health and lessened her anxiety. We also talked about the spiritual aspect of doing our job as homemakers. The benefits of cooking in cast iron was also discussed. Thanks Olga! I mix things up by basing this short cleaning talk through on a different house than my own. I also mention cleaning up after toddlers and cleaning during the nap. I talk you through cleaning your whole house and even nag you a little about your living areas. And, yes, I tell you all about my mollies, platy fish, and java moss. I also give a shoutout to another podcast called Tech Daily. 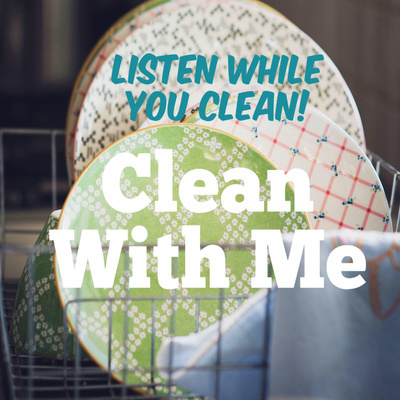 I talk you through cleaning your whole house while emphasizing the concept of “cleaning as you go.” We also hear from a brand new listener and fellow podcaster on the subject of laundry. Get some cleaning motivation and catch up on some housework as I talk about improving daily habits. I talk you through cleaning your house while giving you cleaning motivation and cleaning tips. Is your house decorated? Do you have a coffee station? Can intermittent fasting help you lose weight? Clean with me as I discuss these topics and more. I talk you through cleaning your entire house and touch on my recent weight loss. I talk you through cleaning your house and give a couple of shoutouts. I appreciate all positive comments, ratings, and reviews! I talk you through cleaning your entire house and cover random topics including table leaves and playpens full of laundry. Be sure to listen all the way to the end for a decluttering challenge. Here’s the link to my Instant Pot Spanish rice recipe: https://youtu.be/YQrEpXPUDoU Or look up “Raani Starnes” on YouTube. 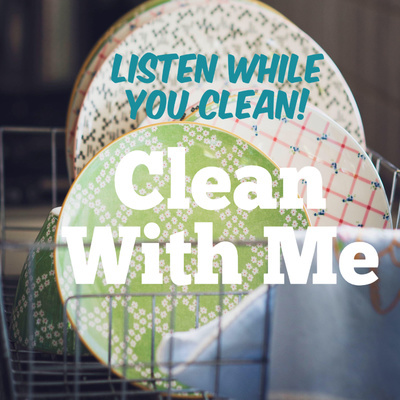 I talk you through cleaning the house and discuss topics including delegating chores to kids, making homemade sub rolls, coping with hot flashes while shopping, and decluttering drawers. Whole house cleaning talk through where I cover topics including doing laundry after a trip, putting away Christmas decorations, and turning over a new leaf diet wise. I talk you through cleaning each area of your home in a relaxed way while reminding you to declutter now that Christmas is over. I also give my thoughts on donating to charities with thrift stores. I talk you through cleaning your priority areas and preparing your kitchen for guests by having a clean fridge and pantry. I also talk about a great bathtub caddy solution from one of my listeners! In this cleaning talk through episode I talk you through some light house cleaning in your priority areas, and I also have you answer some questions to determine how organized you are. I talk you through cleaning your entire house, starting in the kitchen, and I talk a little bit about Christmas shopping and what to have in your freezer and make during the busy holiday season. Hint: It’s a dump dinner for your crockpot or Instant Pot. I talk you through cleaning your entire house and also discuss topics including having a living room toy box, cleaning a sponge in the microwave, and keeping your master bedroom clean. I talk you through cleaning your whole house and discuss topics including white elephant gift exchanges, Christmas wish collages, and welcome mats. During most of the episode, I was actually cleaning while recording. I talk you through cleaning your whole house with the most time spent in the bathrooms today. I talk you through cleaning your whole house and also recommend you do a few things before bed tonight. Listen all the way through because there’s a funny part about preparing for short notice guests! I talk you through cleaning your entire house and discuss topics including cluttered surfaces, age-appropriate chores for kids, and even weight loss. Realistic Changes to Make Today! 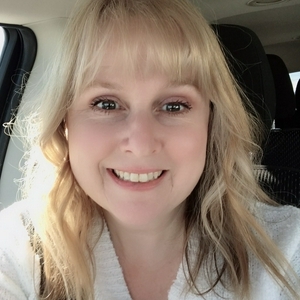 Cleaning power hour where I talk you through cleaning your house as I discuss topics including dishwashing detergent, cleaning products in general, decluttering, shoes, saving money on groceries, and looking good for your husband when he gets home. I talk about deciding what your bare minimum chore list might be on those days when you don’t clean the entire house, weekly cleaning vs. daily cleaning, getting up earlier on days you are going somewhere, laundry struggles, and much, much more. Try to Speed Clean Your House in 20 minutes! This cleaning talk through is almost a cleaning power hour and is all about preparing for Thanksgiving. I give my thoughts on how to have your home company ready, and I also tell you everything I’ll be serving and what I’ll be making the night before. Bonus: I tell you my special green bean casserole recipe that is different than the usual! Happy Thanksgiving, and don’t forget to give me a 5-star rating on Apple podcasts or on the iTunes desktop if you are thankful for this show! In this episode, I remind you to be productive while I explain how to keep your whole house clean all of the time. I talk about my “whole house approach,” which entails things like prioritizing, tidying, and deep cleaning as needed, during a daily walk through of your entire home. I give shoutouts to those who have reviewed me on iTunes, but I also appreciate those of you who may have reviewed me on other apps—and I just didn’t know about it! Please keep those 5-star reviews coming! I can’t thank ya’ll enough! See how much you can get done in your own home as you listen to me clean for 35 minutes. I also talk a little bit about delegating chores to kids, the changing weather, and organizing my fall wardrobe. Don’t forget to subscribe and give me a positive review! Thanks in advance! Hour and a Half Long Cleaning Talk Through! How to make your dishwasher work for you in spite of hard water and/or septic tank regulations. We also talk about an easy one pot meal you can make today in your pressure cooker. Clean Your Whole House Today! I talk about my “whole house approach” to cleaning as opposed to having designated days for weekly tasks. How to implement better housekeeping habits so you can grow as a homemaker. Various laundry methods are also discussed. Cleaning motivation podcast about how to get started cleaning your house and what to clean first. This first episode includes a brief introduction explaining what Clean with Me is all about.